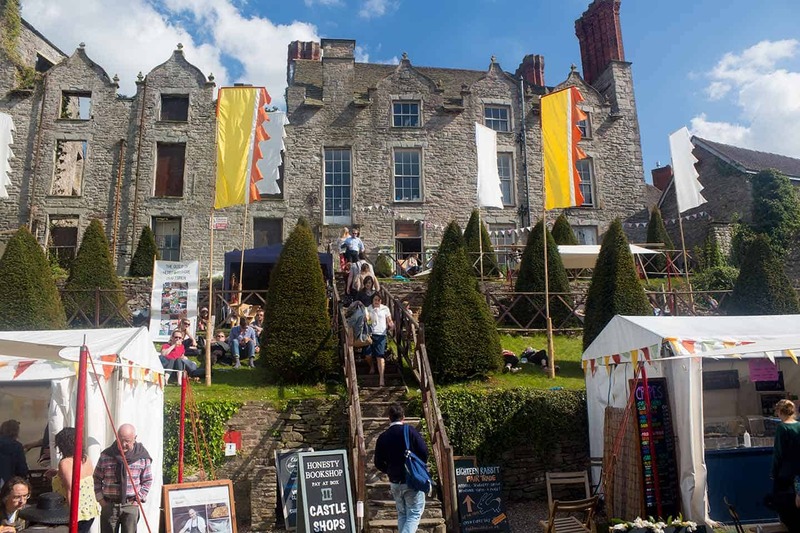 It’s best known as the town of books, and hosts the Hay Festival of Literature and Arts each year. Yet there are plenty more things to do in Hay-on-Wye than shop for books. It’s one of the most fascinating places to visit in Wales, a rural cultural melting-pot that has grown from the seed of the bookshops. Hay is also on the edge of the Brecon Beacons National Park, a series of small mountain ranges across the southern part of Mid Wales. It’s also next door to the beautiful, bucolic English county of Herefordshire, and sits about halfway along the course of the lovely River Wye. Our guide to the best Hay-on-Wye things to do takes you around the town and out into the surrounding countryside. It feels slightly detached from the modern world, and it is a fair way from anywhere else, close to the empty rural heart of Wales. You can only get there by road, footpath or canoe. It’s metaphorically – if not literally – a bit off-grid, somewhere to escape the stresses of the world. 2 WHERE IS HAY ON WYE? 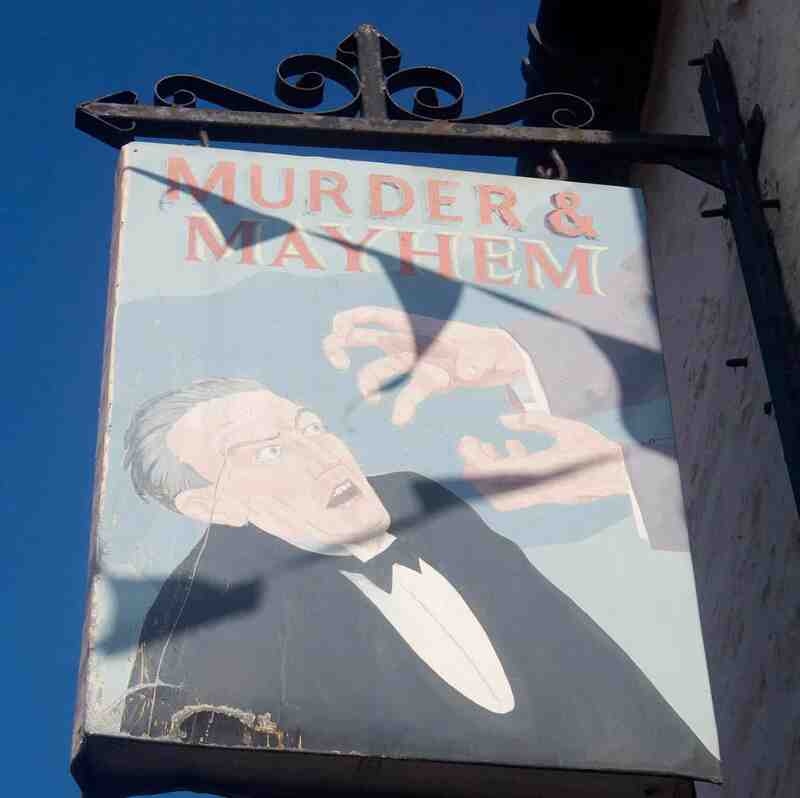 4 WHEN TO VISIT HAY ON WYE? Once a country backwater, Hay is home to one of the best arts festivals in the world. It once had around 50 bookshops around the town – this has dwindled to closer to 15. Some excellent specialist shops have arrived to take their place. The world has moved on, Hay has diversified, and it has also become one of the best places to eat out in Wales and the border region. Richard Booth, who led the move to turn Hay into a town of books, did so to give the place a future, avoiding rural anonymity and obscurity. He did that, all right. It’s unique and quirky, somewhere that surprises even someone like me who has visited over twenty times. I’ve always considered it one of my spiritual homes, and always will. 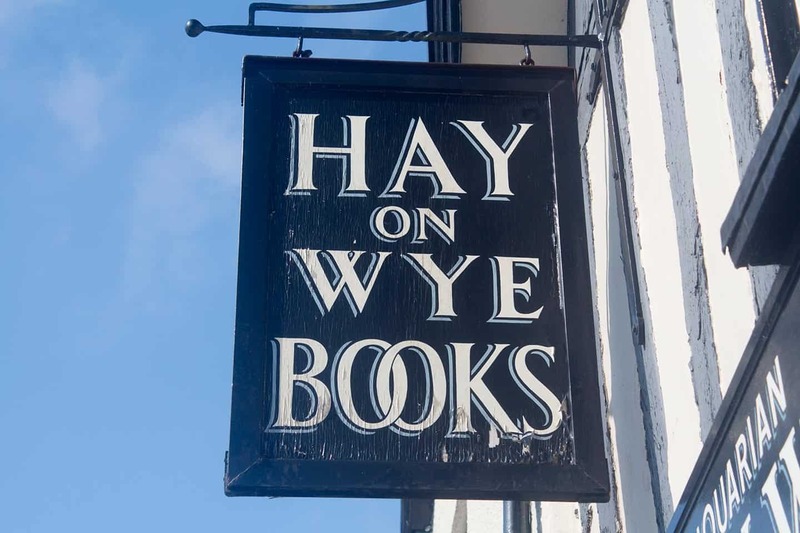 WHERE IS HAY ON WYE? Hay-on-Wye is situated on the border between England and Wales. Most of the town is on the Welsh side of the border. It’s towards the southern end of the Welsh county of Powys, which occupies most of rural Mid Wales. The English county of Herefordshire is across the border, and the city of Hereford is 20 miles (32 km) away. Hay is on the B4350 road just off the main A438 road between Hereford and the Welsh town of Brecon. It’s roughly halfway between the two. Driving is by far the easiest way to get to Hay. It is possible to reach Hay-on-Wye by bus. Six T14 services a day connect Hay with Hereford, an hour away. There are also four daily services from the Welsh capital, Cardiff via Brecon. The nearest railway station is in Hereford, where the T14 calls, roughly every two hours. 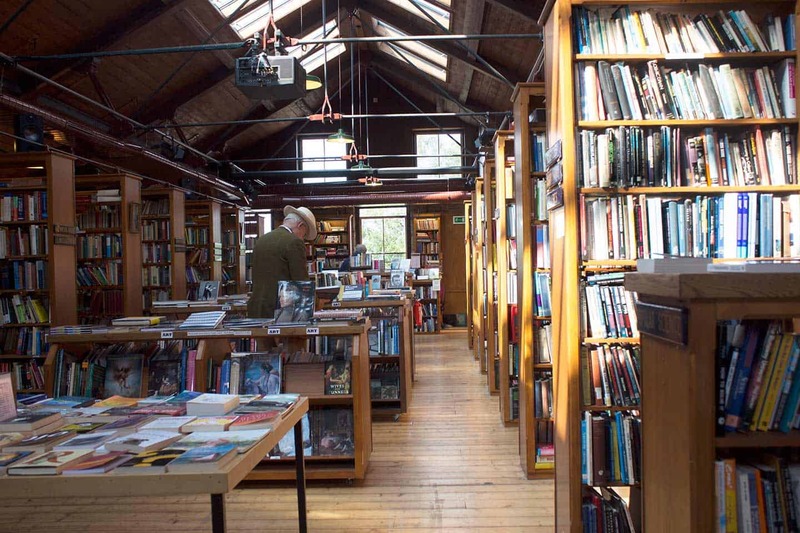 WHEN TO VISIT HAY ON WYE? Hay is very much a year-round destination. In spring and summer, either side of Festival time, it’s a wonderful place to look up and admire the mountains. And, better still, climb them. In winter, it has a cosy, warm feel. This is the time to browse bookshops for hours, find some original Christmas gifts and enjoy some fantastic food. The streets of Hay-on-Wye aren’t just lined with bookshops. Some are simply lined with books. There are several honesty bookshops around Hay, including on the Backfold, and on the terrace below the 800-year-old Castle. These are shelves of books with a money box attached. I always enjoy browsing these shelves. You always come across some random oddities like a thick user manual for a typewriter from 1975, next to a soap opera yearbook from 1981. They’ll never be of any use, but it’s wonderful that they’re still here. A short walk up the hill from the Clock Tower is Richard Booth’s Bookshop. This is where Hay’s journey to centre stage in the literary world began in the early 1960s. He began inporting thousands of books from libraries that had closed in the USA. Booth later proclaimed himself ‘King of Hay’ and designated his horse Prime Minister, something a few other countries should consider. Booth has since sold the shop, but it’s an essential stop if you’re visiting Hay-on-Wye. It’s a vast shop, spread over two spacious floors. It has embraced diversification like the rest of the town, with a café and cinema added in recent years. It’s a wonderful place where I always set aside an hour or two to browse at random, gathering an armful of new food for the soul before I leave. A five-minute walk across town takes you to the first bookshop to open in Hay back in 1965 – the vast labyrinth that is the Hay Cinema Bookshop. 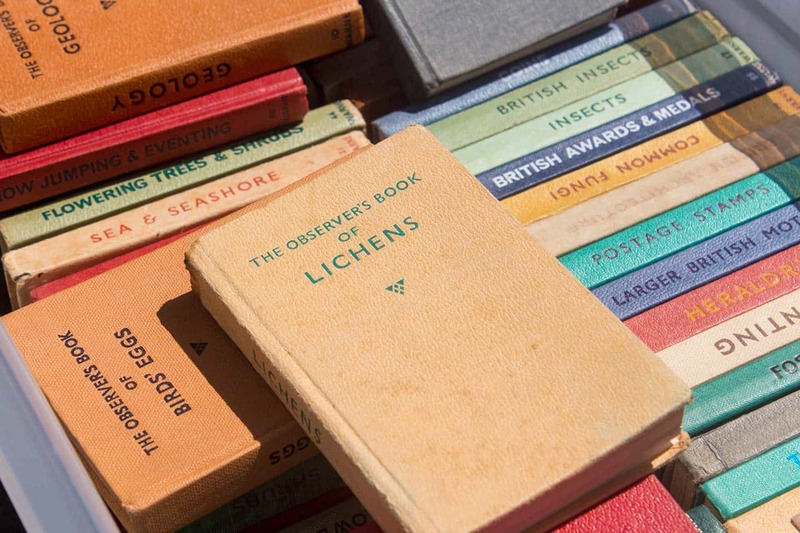 I had to smile when I glanced through their website while researching this piece – “You won’t find any books for sale on our website….If you want to take advantage of our unmissable offers you’ll have to come to Hay-on-Wye.” I couldn’t put it better. Hay Castle is the most prominent sight in the town, and has bookshops clustered around it and inside it. The castle is over 800 years old, and the remains date from Norman, Jacobean (early 17th century) and Victorian (19th century) times. It is currently undergoing restoration, and is due to be re-opened in 2020 as an arts, cultural and education centre. Every time I visit Hay I notice more and more non-bookshops opening up. Over my last few visits I’ve found speciality shops in Hay-on-Wye selling things as diverse as antiques, boutique clothes, bespoke furniture, outdoor gear, specialist maps and chandeliers. Hay’s markets are also a great draw – the Thursday market is one of the best in the region, taking over the area around the clock tower, Cheese Market and Butter Market. The Produce Market is also held on Saturdays while the Flea Market takes over the Butter Market and adjacent area next to the Castle, where pop-up food stalls also make an appearance. 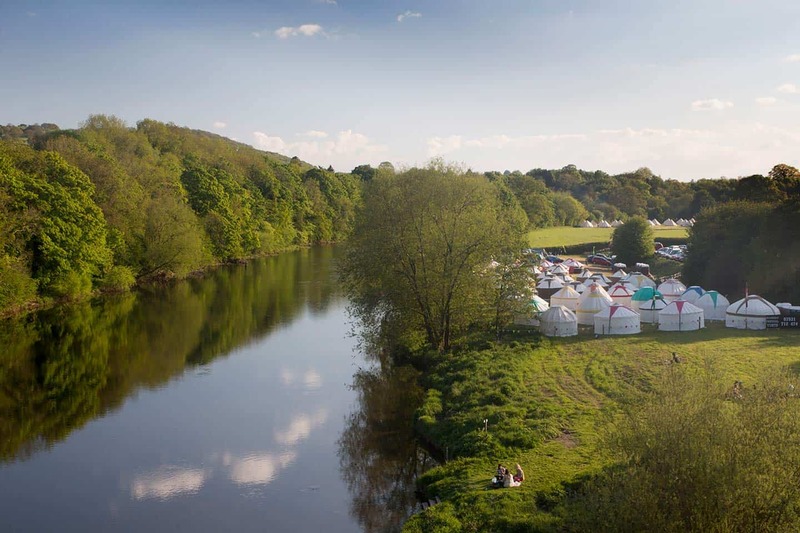 The Hay Literary Festival is one of the best literature and arts events in the world. It started out in humble beginnings in 1988 at the local primary school. 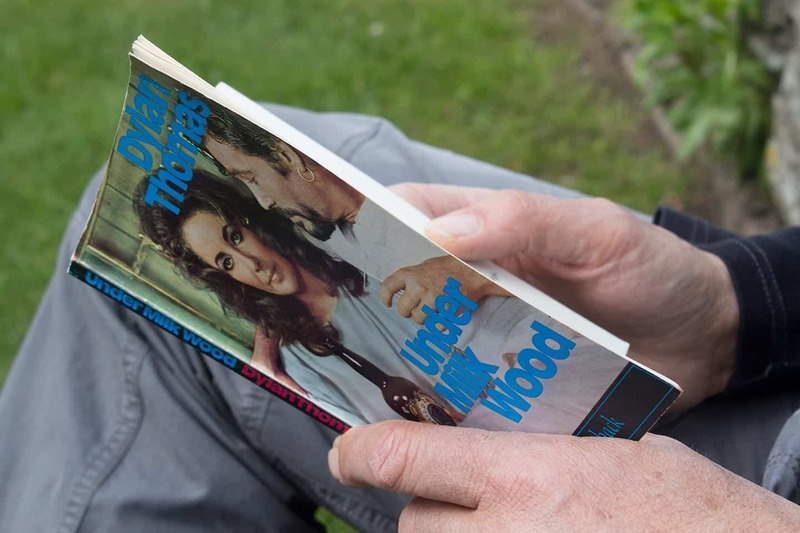 The following year, American playwright Arthur Miller was persuaded to attend (after supposedly asking if Hay-on-Wye was ‘some kind of sandwich’), and things took off from there. For many years it has been held at a large tented site just outside the town on the way to Brecon. The Hay Festival programme is also eclectic and varied, attracts a vast range of writers from right across the literary and arts spectrum and beyond, and having visited several times over many years, we can safely say this brilliant event is one of the most extraordinary festivals we have ever attended. Past speakers include the likes of Bill Clinton and Desmond Tutu. Another festival now runs alongside the Hay Festival at the same time. How The Light Gets In has a mixture of philosophical debates and music concerts. The 2019 event starts on 24th May, and runs until the 27th. It has sister festivals around the world, including in Spain, Denmark, Mexico, Colombia and Peru. 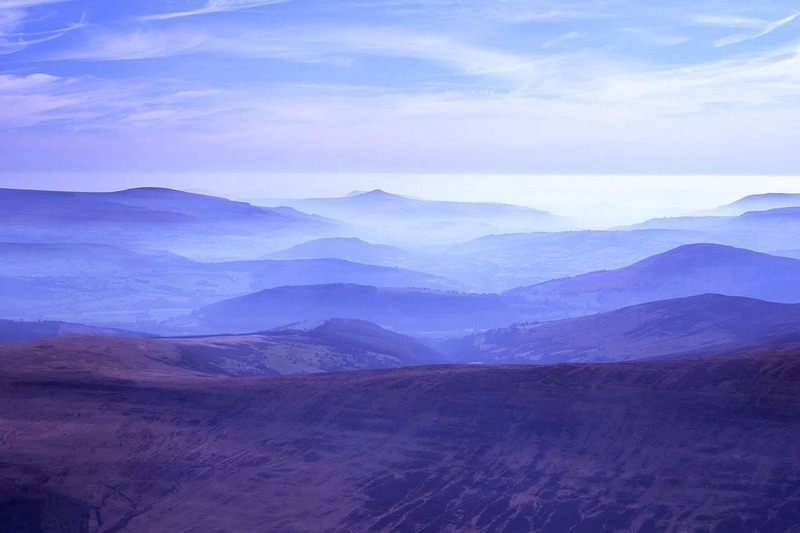 The Brecon Beacons is paradise for those looking to get out and explore the countryside. 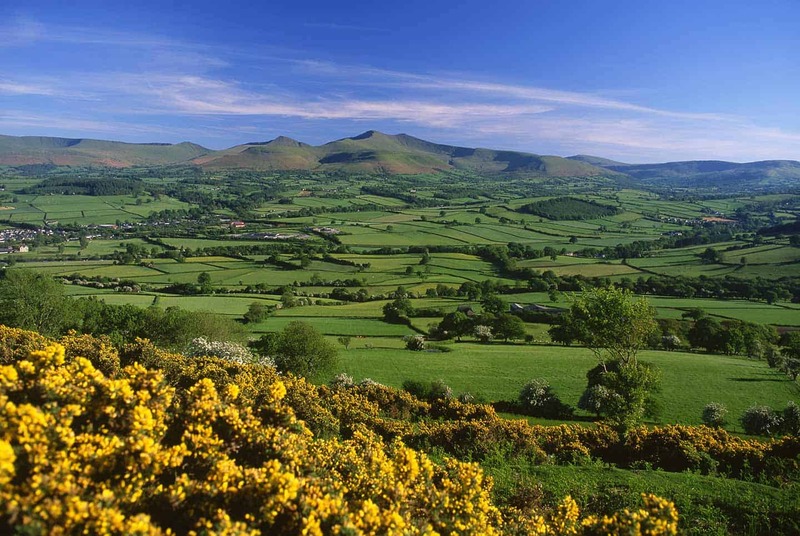 Hay lays at the base of the northern escarpment of the Black Mountains, the easternmost of the ranges that comprise the Brecon Beacons National Park, which extend down to Abergavenny in the south and Mynydd Troed, overlooking Llangorse Lake, a few miles from Brecon, in the west. There are some great Hay-on-Wye walks, including the section of the Offa’s Dyke Path long distance footpath, which skirts the edge of the Brecon Beacons National Park. This culminates in the short, steep Hay Bluff walk, which has outstanding views over the patchwork of fields of Mid Wales. The central Brecon Beacons range is to the south of the town of Brecon. One of the most popular Brecon Beacons walks is the Pen y Fan walk. There are several routes up the mountain, the highest in southern Britain, the shortest of which is from the Storey Arms / Pont ar Daf car park off the main A470 road to Cardiff. This takes anything between 40 minutes and an hour in good conditions. The reward is an incredible 360° panorama: I’ve seen it so clear there that the mountains of southern Snowdonia are visible to the north, and the coast of Somerset and Devon can be seen to the south. One of the best walks in Brecon Beacons is the circular route to the summit of Pen y Fan from Upper Neuaddd reservoir, to the south. It’s a much longer, more strenuous route than the one from Storey Arms but if the Brecon Beacons weather is good, it makes for one of the best days out in Wales. The National Park actually extends well to the west of Brecon, almost as far as the town of Llandeilo. The Fforest Fawr section lies to the immediate west of the central Beacons, and beyond that lies the Black Mountain. Both are remote, largely upland areas, with vast empty mountain areas to wander for hours without seeing a soul. One place I’d particularly recommend seeking out is Carreg Cennen Castle, one of the finest castles in Wales. It’s around 6 km from Llandeilo, a spectacular medieval ruin on top of a dramatic precipice. The Llanthony Valley – also known as the Vale of Ewyas – is one of the most remote, beautiful valleys in the whole of the UK. It’s a five mile drive up from Hay to the base of Hay Bluff, the mountain that looms above the town the quaintly named Lord Hereford’s Knob (Twmpa in Welsh). The narrow, spectacular Gospel Pass (Bwlch yr Efengyl in Welsh) runs between Hay Bluff and its sister peak, the quaintly named Lord Hereford’s Knob (Twmpa in Welsh). Here you gradually descend across open moorland, reaching the valley floor and the tiny hamlet of Capel-y-Ffin (the ‘chapel at the border’), which takes four seconds to drive through yet packs in two chapels, a tiny, exquisite church and a ruined monastery. Four miles further down the valley, the ruined church and precincts of Llanthony Priory are just off the road to the left. 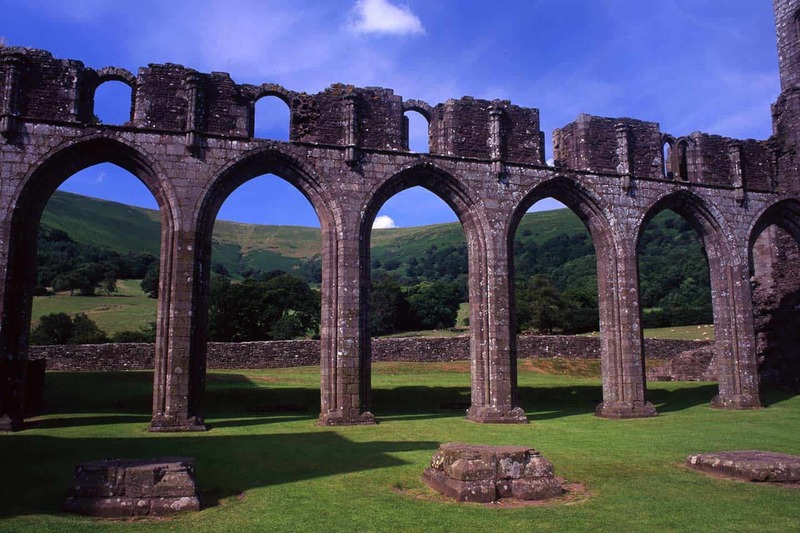 This is one of the most special places in all of Wales, the row of roofless ruined nave arches open to the elements with the awe-inspiring backdrop of the Hatterall Ridge behind. 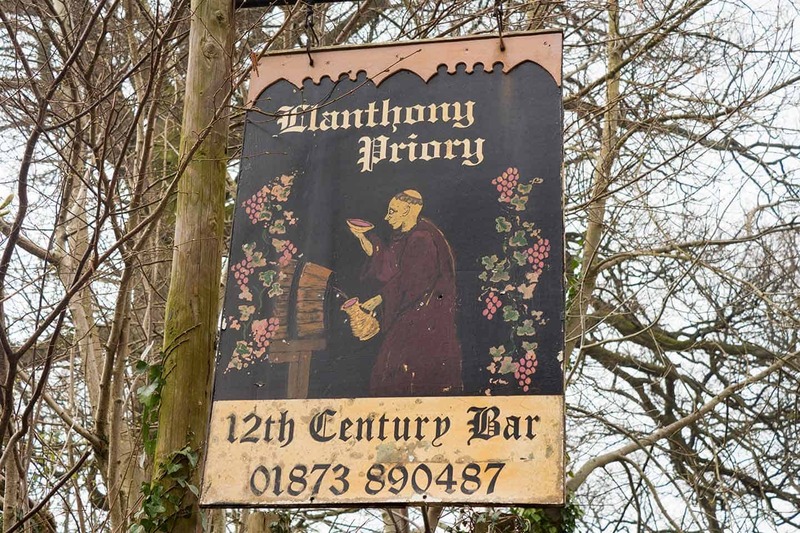 The small Llanthony Priory Hotel and pub are built into the 12th century ruin – it’s hard to think of anywhere more evocative to sit outside for dinner and a pint than under the church arches on a warm summer evening. Hereford is one of the smaller, less known English cities. It has the feel of a small country town, yet is home to a gem of a medieval cathedral. This is also home to the Mappa Mundi, a late 13th century map of the world on vellum calfskin. The city is situated – like Hay – on the River Wye, from which there are some wondrous views of the Cathedral. The city centre also has several other medieval buildings, built in the distinctive black and white half-timbered style common along the Welsh-English border. 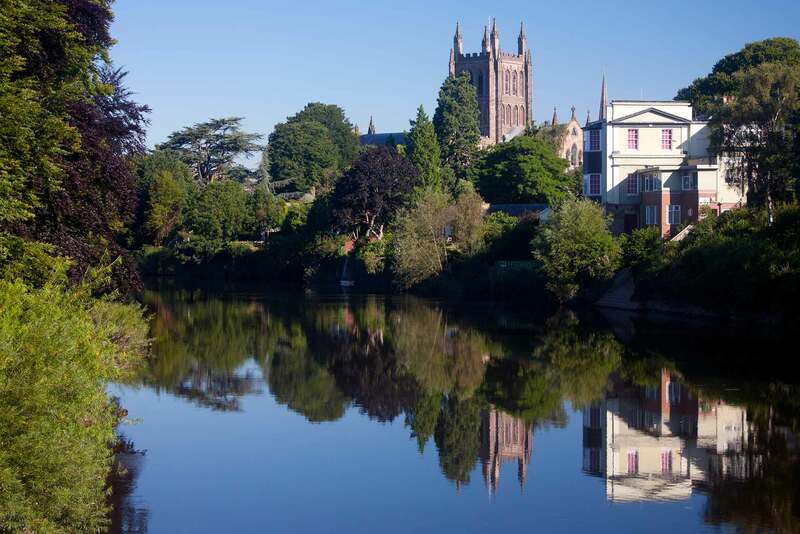 Our feature on things to do in Hereford tells you about the city in much more detail, as well as things to do near Hereford. 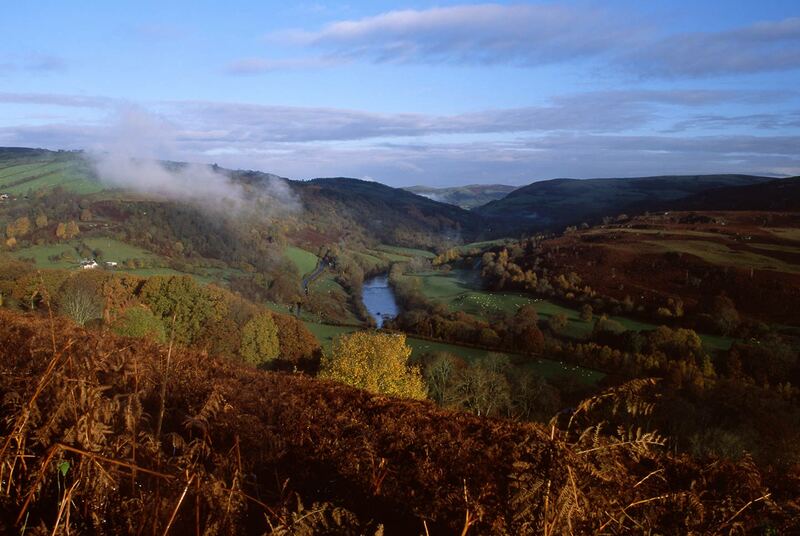 The southern section of the Wye Valley is the birthplace of British tourism. The area around Tintern Abbey was especially popular, as an appreciation for the ‘picturesque’ started to develop in the 18th centuries. Visitors would explore the valley, mainly at river level, taking boat trips from Ross-on-Wye To Chepstow, and stop to sketch or paint places along the way. The River Wye has formed some varied landscapes along its course from the mountains of Mid Wales to the sea. Hay is an ideal base to see it in its many different guises. The upper reaches of the Wye are to the west and north-west of Hay. Here the river passes through some rugged, hilly country. There’s one particularly good viewpoint from a minor road just to the north of the village of Erwood, which is on the main A470 road. Otherwise, you see plenty of the valley as you head north, both before and after the town of Rhayader. One of the best things to do in the Wye Valley is to follow the trail of the very first British tourists by taking to the water. One way of doing so is to canoe the Wye. Wye Valley Canoes operate from Glasbury-on-Wye, four miles (6 km) from Hay. You can paddle to Hay, which takes around four hours. After Hay, the Wye winds its way through the Herefordshire countryside before returning to form the Welsh border for its final journey to Chepstow and the sea. Symonds Yat is another great place to explore the river and surrounding area, with one of the most famous views over the river from Yat Rock. The southernmost section of the river is perhaps the most beautiful. The Wye slowly meanders through steep wooded countryside. 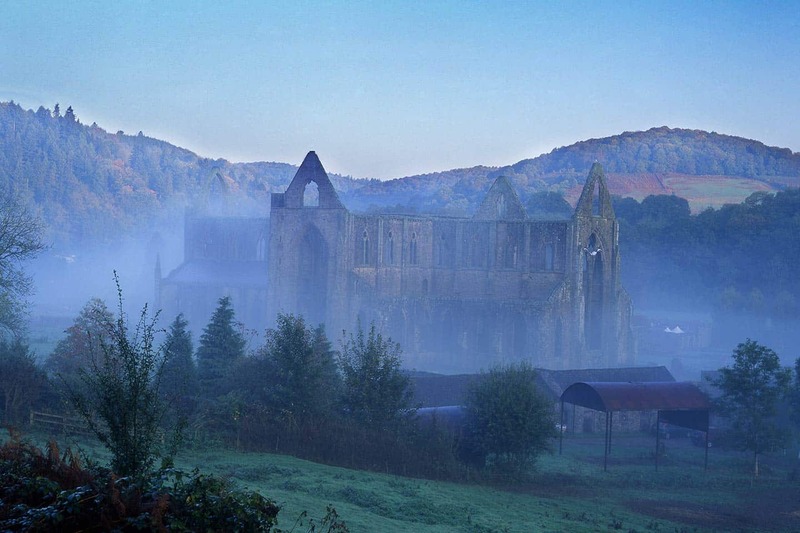 It’s especially beautiful in autumn, and there are few things to do in Wales to match seeing an autumn sunrise at Tintern, with the mists cloaking the evocative Abbey ruins. The Swan at Hay is one of the best hotels in Hay. It occupies an atmospheric Georgian building which was formerly a coaching inn. The bistro is also one of the best restaurants in Hay-on-Wye. If you love staying in historic old buildings, you’ll love the Old Black Lion in Hay-on-Wye. It dates back to the 17th century, and it’s believed that Oliver Cromwell stayed there. This was while his Roundhead troops besieged the Castle around the corner, which was still in Royalist hands. It is now a luxurious 4-star inn, and one of the best places to stay in Hay-on-Wye after all these centuries. 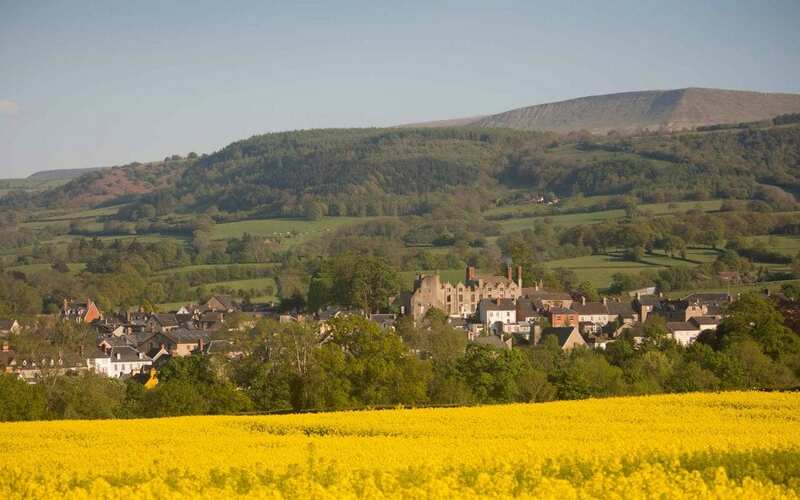 There are also several Hay-on-Wye B&Bs and holiday apartments in and around the town. The Seven Stars B&B has all the home comforts you’d expect, in another lovely historic old house. They also have a heated indoor swimming pool, ideal for relaxation or if one of your children loves a swim like our little fellow. There is always additional Hay festival accommodation each year. This includes a yurt village across the river from the town. The Swan at Hay and the Old Black Lion both serve excellent food. The Old Black Lion give an Italian twist to classic British dishes, and I loved the Parma ham with Perl Las (a Welsh blue cheese) chicken supreme. Tomatitos tapas bar is a relatively new arrival on the Hay food scene, on Lion Street a block along from Booth’s Bookshop. We stopped there for lunch on a long drive down the border a couple of years ago. The verdict – fantastic takes on Spanish classics from chorizo cooked in Herefordshire cider to spicy patatas bravas, with all ingredients locally sourced. St John’s Place, across the street from Tomatitos, is another great little place, with a constantly changing menu with a choice of three dishes for each course. We haven’t dined there yet but have heard several personal recommendations, all from trusted sources. We’ve also dined at the Three Tuns a few times. It was one of the oldest pubs in Hay, run for decades by a wonderful lady who finally retired well into her eighties. It’s now a gastropub and they also happen to serve the best pizzas in town.